In my first hour session, I took out all the clothes and tried them on for size. Then I only kept what fit and the items I really LOVE. I heard a great idea here. Turn your hangers around the wrong way and hang your clothes on them. When you wear them, rehang the item back on the hanger in the proper position. At the end of a set time, let's say 6 months, you will know which items you wear and which items you never wear making it easier to get rid of those things that just aren't worn anymore. 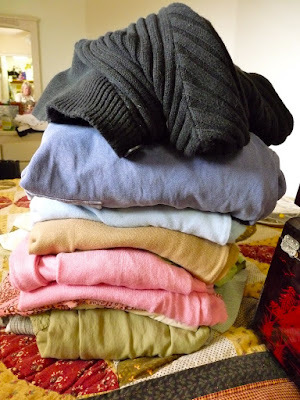 Within minutes, I had a pretty good size pile of clothes to pass down to my daughters and to donate. 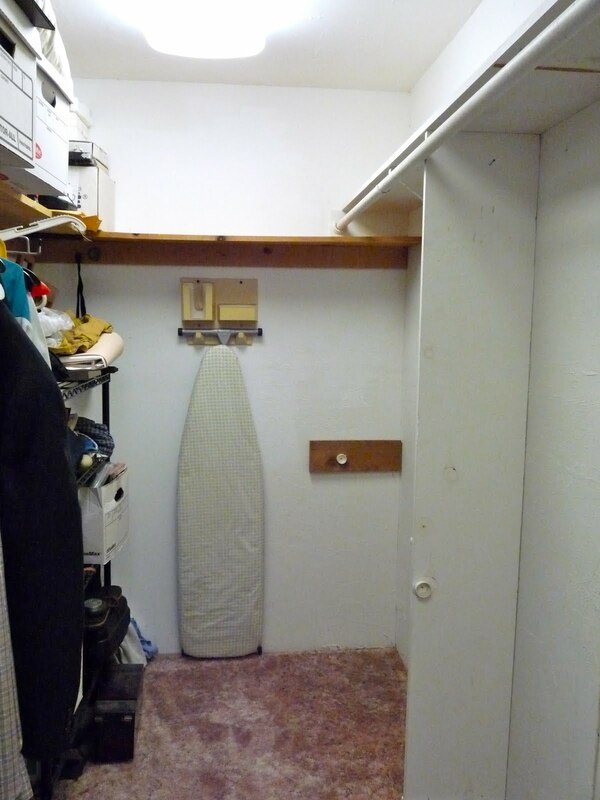 I cleaned EVERYTHING out from floor to ceiling leaving just the bare bones of the closet to work with. There were crates filled with outdated hats and purses. Oh, and on THAT note, I actually found enough Starbucks cards to make $10.50 worth of drinks. Did my daughter and I ever celebrate when I finished this task. My side is the right side of the closet where it is all cleaned out. The ironing board at the back of the closet will be staying there because my sewing area is upstairs and that's what I end up ironing the most. Looking at the structure I already had and knowing I couldn't spend too much money right now, I decided to make 3 separate areas along the wall. The first area, deepest into my closet would be for dresses and longer skirts. It is on the small side but I don't work and don't wear dresses all that often. The area on this picture labeled "shoes" still needs to be built. It would hold several pairs of shoes. Overflow shoes will be kept on the shelves above. The next would be a double layered area for blouses, sweaters and pants and skirts on the bottom. 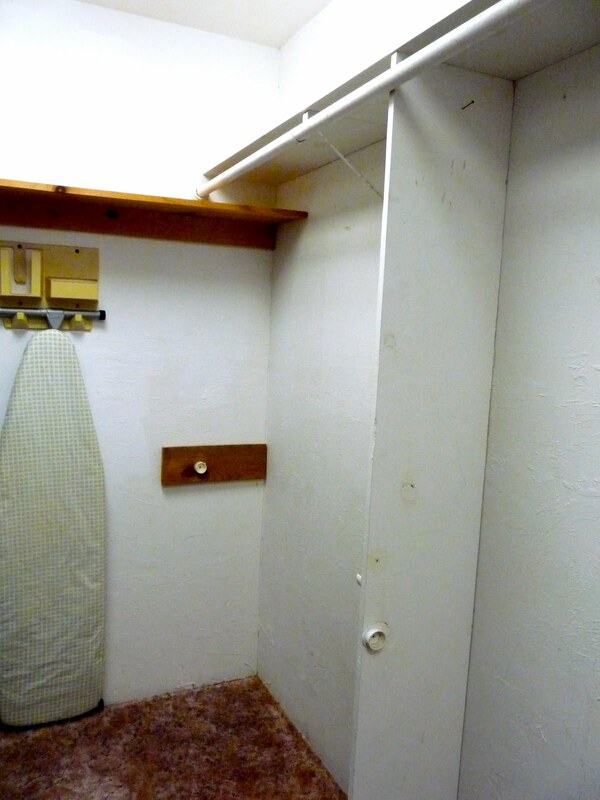 And the last area will be behind my closet door in the craft area you see in the first picture. What I'm envisioning here are several large matching laundry baskets that I could fill with seasonal clothes. See those baskets on the top shelf? Well, I'm hoping to store my sports stuff in something like that. Right now they are all separated into bags or backpacks. These are what I'm hoping to find. Or maybe something a bit larger. I'm limited by the shelf being only 11" deep. If any of you have storage problems like I do, I would recommend looking for this magazine at your local bookshop. It is SO good and has so many ideas for every area of your house. So yes, my Simplify 101 classmates... I'm hoping to wrap up the closet very soon. My delay is having my hubby build the shelves in for the shoes and put in the closet rods. I will keep you posted but it's looking REALLY good!